Heroes of Three Kingdoms is one of Perfect World Entertainment’s upcoming MMORPGs. The game is based on the historical Warring States Period, stamped into the annuals of history in Romance of the Three Kingdoms, one of China’s Four Great Classical Novels. How will this title differentiate itself from the massive number of Asian-themed MMOs out in the market? OnRPG: Hello, I am Fo Po (cinderboy), OnRPG journalist. Can you please introduce yourself to the readers? Hello, my name is Aaron (A.J.) 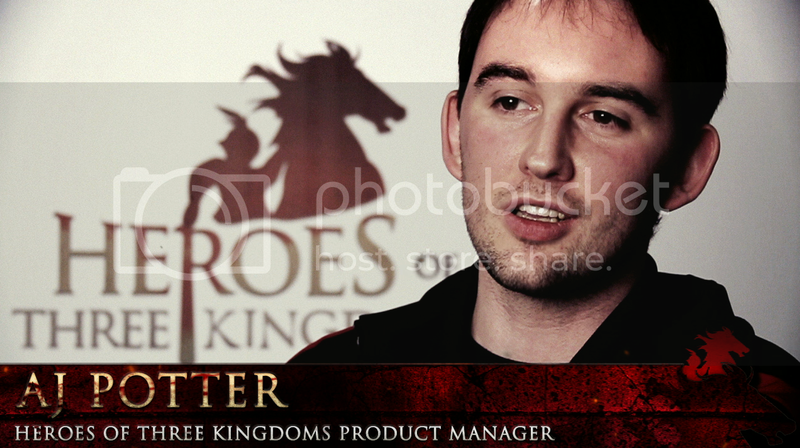 Potter-Product Manager for Heroes of Three Kingdoms. As a fan of the Three Kingdoms period, when I was given the responsibility to spearhead the effort to bring Heroes of Three Kingdoms to the North American audience, I was thrilled. I look forward to showing you what all Heroes of Three Kingdoms has to offer. OnRPG: What is the main difference between Heroes of Three Kingdoms and the other games in Perfect World Entertainment’s stable? First and foremost, Heroes of Three Kingdoms is the first MMORPG in our portfolio that is based on history. Players will have the opportunity to choose between one of the Three Kingdoms during that period-the Wu, Shu or Wei. Unlike other MMOs, your “class” is determined based on what weapon type you choose-and you can even go on to master two! This is also my favorite feature, as it means that I’m no longer locked into a particular role, and I can switch depending on who I’m grouping with. Interacting with players and guilds becomes a very important part of the game, as Heroes of Three Kingdoms has an extensive Territory War system, which will pit kingdoms against each other. Players will be able to turn the tide of war in favor of their side, earn different titles and even become a general of their kingdom! OnRPG: Heroes of Three Kingdoms is loosely based on the classical novel, Romance of the Three Kingdoms. There are many great warriors, leaders and rulers who brought the whole storyline to life. What roles do they play in the game? Fans of the classical novel, and the Three Kingdoms era, will be able to see their favorite warriors, leaders and rulers throughout the game. Through the Campaign mode, there are a variety of different tasks available for players to experience-from fighting alongside Zhao Yun to rescue Liu Bei’s son, to infiltrating an enemy’s camp undetected to steal documents. OnRPG: When will players get to choose which of the 3 kingdoms they can pledge their loyalty to? What differences will there be choosing between the 3 kingdoms? Beyond the ability to acquire unique equipment, joining a kingdom will also grant players entrance into their respective fortresses, where players may acquire a number of quests. And of course, most importantly, your faction determines the side that you will fight for in the Kingdom War system. OnRPG: One of the main features of the game is the weapons system where players get to choose one of the 18 weapons available to specialize in. Will players get to change their specialization or even master a second weapon as they progress? Absolutely-players are able to choose from any of the other weapon types at any time. Besides eliminating the need to create ‘Alt’ characters, this allows the user to create their own hybrid classes, and to form their own play-style, able to adapt to any situation. Players can ultimately master every weapon, as well as acquire the ability to wield two weapon types. OnRPG: Developing the skills for 18 weapons must be no easy feat. How many skills are available for each weapon type? Will players be able to master every skill? In order to allow ease of access-as well as to not appear daunting-there are often no more than 20 actively used skills available to any particular weapon. Considering the number of weapons available, and the potential skill combinations-it was our goal to allow players to focus on their current objectives, and not on what button to press. There are, however, many passive skills which augment actively used skills, as well as to provide passive benefits to the character. OnRPG: Will all 18 weapons be available at launch? There is no set number, though it will likely depend on the status of translation and localization at that point. The great thing about Heroes of Three Kingdoms though, is that once these weapon types are ready and made available, players will not be forced to restart in order to utilize them, and they may continue with their existing characters. OnRPG: How is the combat system in Heroes of Three Kingdom like? Will it be any different from the normal Point and Click system found in most MMOs? In terms of the combat system itself, the style and animations are very fluid and natural, as we used motion capture technology to record the movements from a martial arts expert. As for basic gameplay and movement, players will be able to point-and-click or use WASD-style movement keys. OnRPG: Will there be a system in place to make sure one kingdom is not overpopulated, hence causing an unfair numerical advantage during kingdom wars? Though there are a number of variables that determine how Kingdom Wars progress, to summarize-each kingdom is only as powerful as the combined ability of all players for that faction. As players within each faction will have to manage regions that they conquer, neglecting to do so will make it easier for rival factions to take them over. Further, as the regions grant resources needed in order to fuel the war effort, the more regions that are acquired, the more these resources are stretched, and the more vulnerable they become. OnRPG: Speaking about kingdom wars, what requirements are needed for players to participate? Are the kingdom wars a 24-hour feature or only available during specific times? In order to allow users on both sides ample time to prepare, there are designated times in which the attacking force may launch their assault when attempting to conquer a region. However, players may also initiate raids into enemy territory prior to the siege, where they can attempt to weaken their forces and sabotage defenses. OnRPG: Surely a trademark of Perfect World Entertainment games now, is the massive amount of gorgeous mounts found. Being in the Warring States Period, what kind of mounts can players expect? We definitely have quite a few mounts, but unlike some of our fantasy-based MMOs, the mounts found in Heroes of Three Kingdoms are mostly based in reality. Players will be able to have a variety of horses, elephants, and even tigers. One interesting thing is that mounts in Heroes of Three Kingdoms replace the pet system found commonly in other MMOs, as players are able to upgrade their mounts, changing both their attributes and appearance. OnRPG: Can you tell us more about the siege system found in Heroes of Three Kingdoms? Will there be many different kinds of siege machines available for different uses? Without going too much in depth, the siege system is one of the highlights in Heroes of Three Kingdoms, and players will be able to experience a multitude of siege weaponry available during the Three Kingdoms era. Players who learn how to best utilize the siege weaponry will have a distinct edge that will allow them to lead their kingdom to victory. OnRPG: The Battle of Red Cliff is one of the most epic battles fought during the Warring States Period. Naval strategy was used widely during this period to gain victory. Will we be seeing any naval action in the game? I’m glad you ask, because as you mentioned, naval warfare was a key part of the Battle of Red Cliff. While the open beta will not have naval warfare, this is something that we are currently looking into, and is definitely something we are hoping to achieve in Heroes of Three Kingdoms. OnRPG: Players will also get to conquer cities found in their own kingdom. Is this part of the PvP features found in the game, like a territorial guild war? Yes, the territory-or Kingdom War-system revolves around the conquering cities, constructing fortifications, managing their resources, and defending them against enemy attacks. OnRPG: There will be a Ranking System found in Heroes of Three Kingdoms. Does this mean players can actually serve the imperial courts of their respective kingdoms? What new features will open up to such players? Yes, players who gain higher reputation and respect through natural game progression will get special privileges-such as titles or items. OnRPG: We have been talking mostly about kingdom wars and PvP. Will the PvE system found in Heroes of Three Kingdoms as exciting as PvP? The highlight of PvE definitely revolves around the Campaign system, where players may participate in historical events, each with a variety of objectives and different play-style. With roughly 75 to choose from, these Campaigns serve to both retell the story of the Three Kingdoms, as well as to introduce a new and unique gameplay feature. OnRPG: What are some of the events planned as the game gets ready for an official launch? Along with the typical closed beta events, we’re actually giving away $1,500 worth of prizes to our players who participate in the closed beta. All they have to do is redeem a closed beta key for Heroes of Three Kingdoms between now and July 27, 2010. There are some great prizes ranging from the latest Kindle DX reader to copies of John Woo’s ‘Red Cliff’ movie. The only bad thing is that I can’t participate!